The first iPod speaker docking station with built in DAB radio is set for release in the UK in October. 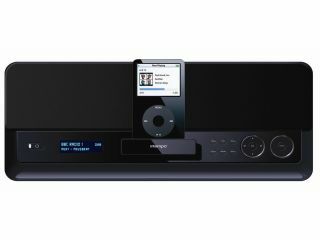 The Intempo RDI-03 combo speaker system will feature dual DAB radio and FM radio alongside its iPod docking capability. The RDI-03 speaker dock is aimed at the high-end of the market with a piano black glossy finish, and is set up with a 30 watt speaker output and integrated 15watt subwoofer. The Intempo RDI-03 supports all models of iPods and has a line in for using with other MP3 players and audio sources. The speaker dock comes with a remote control and also has a clock and alarm function built in. The Intempo RDI-03 will go on sale in Dixons , Currys.digital , Comet and Amazon from October, and will sell for around £99.